In this latest update, we check in on the status of the game and backer rewards, and share a little of what to expect as we head into the new year! We're also making several adjustments to the end game economy by adding an additional tier of high level, master-crafted, items; adjusting merchants to sell more useful gear; expanded their inventory size for easy of use; and adjusted the gold faucets so gold stays useful and not over-abundant through the end game. 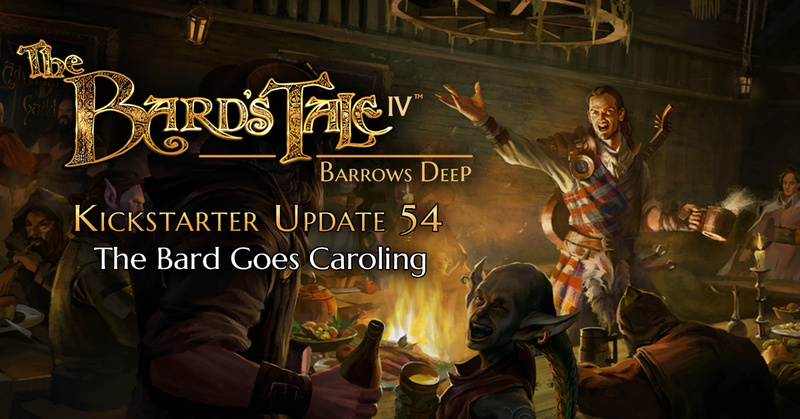 Re: The Bard's Tale IV Update 54: The Bard Goes Caroling! For those of you patiently waiting for the Mac and Linux versions of Barrows Deep, we unfortunately do not have a definitive timeline, but work is progressing on both versions. The increased delay is down to the post-release updates and feature additions, and developing both those updates and the Mac and Linux versions at the same time would have been slowed down both substantially. Now that the game is in its current state however, the pace of development is picking up. Isn't that basically the same thing inXile posted on Steam in October with the release of Patch 3? So, are we looking at early 2019? late 2019? 2020 or beyond? I'm surprised they can't provide a timeline. Any normal project should be able to provide an estimate. Given that the game was delivered a year later than originally announced, they might be feeling a bit gun shy about committing to anything. But, providing only extremely sporadic communication has also been their modus operandi for most of the game's development (pre- and post-release). The communication around patches 1 through 3 was the best I've ever seen from them. That was a very nice and welcome update! Happy New Year! Here's hoping that now that InXile's financing woes are behind it (Microsoft purchase) the company can manage to put up its own web site for its games--I really am nonplussed in seeing that Steamworks is the "official" site for BT IV. That's taking the "Indie" pose a bit far, imo. InXile has been putting out professional products--time to begin acting the part, eh? Fargo is neither a n00b nor an Indie, etc. Sounds to me as if they aren't committing to Mac/Linux versions until they are finished with the original Windows version--which only makes sense, imo. Meanwhile there is always Bootcamp for the Mac, and dual-booting for Linux (much better than an emulator, I should think.) Still, if you have gone this long without the game then I'd certainly advise waiting until the Windows version is 99% done--no real timetable on that, either, unfortunately. We'll see if they make that commitment a reality. Hey. I think so too. I want to quickly play on OS X. What do you think, how quickly will they do everything? So, anyway... I don't want to come off as self-entitled like some posters on these fora do, but I was just wondering: is there any further news of this update? I had the impression it would have been shortly after the new year, but that seemed a bit too optimistic... It's not that I'm impatient, but any new snippets of news about this (even if it's not about the release-date), would be welcomed. This is maybe the only minor point in the communcation between fans and inxile: there isn't much response anymore, these days. Most comments are already from 2018, hardly any of 2019... it's like it's falling still, here. It's quite important to remain in touch with the fans, you know. I was wondering if there was any news of the caroling update? Couldn't say--wish I could...;) They should be keeping the momentum going with both BTIV and the Trilogy...but it seems like everything is beginning to flag in terms of inXile developer interest in BTIV (note: "seems like"). There are multiple ways to keep up the general public interest in BTIV--especially since the next patch is supposed to change many fundamental things in the game--you know, like new videoclip trailers illustrating the new aspects of the upcoming patch--illustrating what is changed, new commentaries, screen shots. InXile should essentially be *relaunching* the changed and improved game, imo! But...nothing so far except a written KS notice! I mean, the KS campaign is approaching *four years old*--it's over & done. InXile should be shooting exclusively for the retail market now! Slam, bam, thank you ma'am time...;) Chop, chop, and all of that. I don't really get what is going on with the Trilogy--but the same thing should be happening there, too! Build the market momentum--don't let people forget these games--hey, get them drooling for them and dreaming about them, instead! Today's gaming market is *huge* compared to what it used to be--just for the PC, alone. But competition is also fierce for every gaming $ people have to spend--and it's for sure that letting your PR and excitement sag is not helping. Every week or two until the relaunch of BTIV and the actual complete launch of the Trilogy (with BT3 and Legacy Mode) something new and "exciting" in the way of marketing should be pouring out of InXile like water rushing over a dam--IMHO, of course...;) Nature abhors an information vacuum, and if InXile doesn't fill it with info on its really great titles--well, that's where speculation begins and a lot of negative and *false* opinion begins to hurt--yeah, if InXile doesn't keep the info spout filled regularly--somebody else with maybe inimical interests will. We've all seen it happen! These games deserve better, imo!